With its employee-centric policies, Delhi Metro has emerged as a soughtafter company in the job market. DMRC's strong work ethic makes it one of the best companies to work for in India. Consider the example of Amit Kumar Jain. On deputation to DMRC from the Indian Rail Traffic Service since 2009, Jain's hard work has not gone unnoticed. He joined as Deputy General Manager (DGM), Marketing, and within a year was given the additional responsibility of DGM, Operations. In 2012, he was also made Principal of DMRC's training institute. 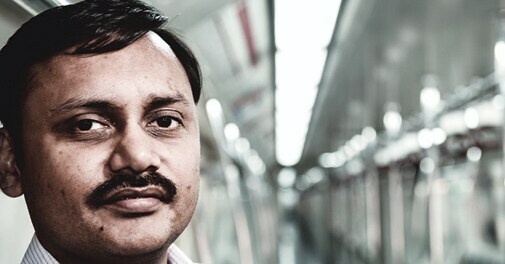 "DMRC has given me multiple roles, while I was only into traffic management in Indian Railways," says Jain. A B.Tech from IIT Roorkee and an M.Tech from IIT Delhi, Jain has also travelled overseas extensively to understand how metro services operate globally. "In terms of technology, DMRC is way ahead of metros in other parts of the world such as Paris or London," he says. Delhi Metro Rail Corporation (DMRC) is fast emerging as a respected brand in the job market. A professional work culture has helped the company leapfrog into the top 25 of Business Today's list of best companies to work for in India. DMRC has seen heavy recruitment over the last few years as it scaled up to commence metro services in the national capital. The company, registered in 1995, began operations in 2002. Along the way the number of employees has grown - from 2,400 employees in 2004 to about 8,000 now, of which 577 (approximately seven per cent) are officers, while the rest are nonexecutive staff. DMRC follows a rigorous recruitment procedure to ensure that only the best make the cut. It recruits in three steps - written exam, interview, followed by a medical test. All the new employees are then given extensive training at its training institute at Shastri Park in Delhi - the only one of its kind in South Asia. They are put through customised training modules on all aspects of operations and maintenance of railbased urban transportation systems. The workshops include teambuilding exercises and simulated training programmes - metro train drivers, for instance, gain hands-on experience on simulators before they drive the train. "On-time performance is one of the first few lessons here as we are providing services. We train staff from other metro systems also such as Bangalore Metro, Chennai Metro, Jaipur Metro, Mumbai Metro, Rapid Metro and Kochi Metro," says Amit Kumar Jain, Deputy General Manager, Train Operations, as well as Principal at DMRC's training institute. Select DMRC executives have to undergo additional training. A batch of 20-odd technical officers, for instance, is sent to IIT Delhi annually for a one-year full-time programme - postgraduate diploma in Metro Technology and Management - sponsored by DMRC. The company spends Rs 7 lakh on such candidates every year, which includes a monthly stipend of Rs 25,000 and free accommodation. So far 105 officers in five batches have been trained, while a sixth batch will be sent to the classroom on July 20. "Besides, there are other two-day, three-day specialised training programmes. The University of Tokyo also takes three DMRC technical officers for a course on transport engineering with a scholarship for three months every year," says Karan Singh, Executive Director, HR, DMRC. Besides investing heavily in training its workforce, DMRC also provides perks to its employees to retain talent. As many as 20 per cent of its employees are provided residential flats - this number is expected to rise to about 33 per cent over the next few years. A (non-executive) DMRC employee is also entitled to a home loan of Rs 15 lakh, and it goes up to Rs 20 lakh at the executive level. DMRC also pays for the medical treatment of staff at leading private hospitals, such as Max and Fortis. The salary compensation is about Rs 36,000 for a junior engineer, while a senior administrative grade officer, equivalent to a joint secretary in government jobs, gets Rs 1.7 lakh. The average compensation is about 20 to 25 per cent higher than at Indian Railways. A highly trained workforce, however, has also meant high attrition at DMRC - particularly with the planned introduction of metro services in other big cities in India such as Hyderabad, Chennai and Jaipur. (Bangalore Metro has already begun operations.) DMRC is the only place that has skilled manpower for these projects. "As 40 per cent of the loco drivers are graduates, B. Tech degree holders who otherwise should have been assistant engineers in IT companies, it is inevitable that they will always be looking out for better profiles," says Singh. Of its 8,000-odd employees, only 4,000 have been with DMRC for about three years or more, and nearly 3,500 employees have left since 2002. People keep trying for better opportunities, says Singh, who has been on deputation to DMRC from Indian Railways for seven years. He, however, points out that the attrition level at DMRC is still between eight to 10 per cent annually, much lower than in some other sectors such as IT, where it is 30 to 40 per cent. "Our recruits do find better avenues outside DMRC. Old-timers at DMRC have a higher level of commitment as earlier it was a limited team, resulting in higher levels of motivation," says Singh. Indeed, given the brand equity of DMRC in the job market, employees say they keep getting job offers from the private sector as well as PSUs, sometimes with a big increase in their compensation levels. However, the work culture at DMRC makes many loyal employees. "There is no better organisation than DMRC. I am paid less here than in my previous organisation but it is the work culture that is driving me," says K.K. Saberwal, Director, Finance, who has served DMRC for over four years in two stints. "I can take decisions quite fast here and that has ensured job satisfaction. DMRC's management is 100 per cent committed to its employees," he adds.